Google Chrome is easily the most popular browser in the world. This is understandable, as in many ways it is a fantastic browser. Unfortunately, it's not one of the most secure browsers. The problem with Chrome is that Google develops it. This is a company whose entire business model is to spy on its users to profile them for targeted advertising. Similarly to Chrome, Edge and Safari all have similar concerns - you can read about these issues at the end of this article. Note that there is a difference between security and privacy. The above browsers can all be considered secure, in that they are difficult to hack and are resilient to website exploits. The problem is that they cannot be trusted not to compromise your privacy to their developers. You should also remember to use a top VPN to help protect you online. As always, if you care about privacy, and using a secure browser, you should use open source software. This includes using Linux as your Operating System (OS). The following private and secure web browsers are all open source. Now let's get on with the in-depth look. Firefox is the only mainstream open-source browser, and the open source code has been fully audited. It is developed by Mozilla Foundation, which claims to be a non-profit organization. With an annual revenue north of $400m, however, it is not entirely clear what this means. Firefox is a fully-featured and secure browser that is arguably at least as secure as Chrome. 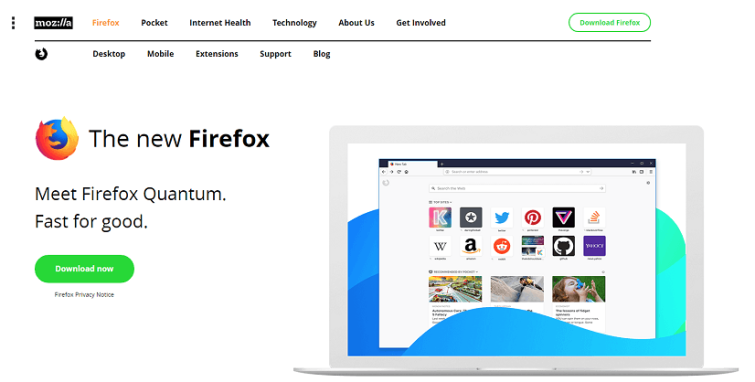 The recently released Firefox 57 “Quantum” has been built from the ground-up to greatly improve speeds, and includes Tracking Protection built-in to the interface. Built-in protection against canvas fingerprinting (the most common form of browser fingerprinting) is also promised soon. “Out of the box,” Firefox is streaks ahead of its mainstream competition, as it does not track your web browsing to target ads at you. However…. to make Firefox the most secure browser you need to change some settings and install some privacy add-ons. Please see our Complete Firefox Privacy and Security Guide for a full rundown of things you need to do to harden Firefox. 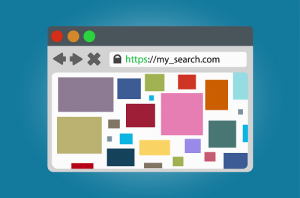 Note that changing privacy settings and using privacy add-ons does make your browser more unique, and therefore more vulnerable to browser fingerprinting. But the upcoming canvas fingerprinting protection (or the existing Canvas Defender add-on) should help to mitigate this issue. Outside of security and privacy concerns, Firefox supports hundreds of very useful or just plain fun browser add-ons. It also features end-to-end encrypted syncing of tabs across browsers and devices, and the ability to send tabs between devices. The new Containers feature allows you to run each tab as a self-contained sandbox to separate your browsing life. This is great for preventing tracking and will enable you to open tabs to different Facebook accounts at once. A recent questionable move by Mozilla has (re)ignited intense debate over how far the company can be trusted when it comes to privacy. Defenders argue that Mozilla is striving hard to maintain an honest balance between creating a privacy-focused browser on the one hand, and the need to create a fully-featured and financially viable product that mainstream users will actually use on the other. Detractors point to a series of decisions by Mozilla that appear to sacrifice privacy for profit. Those concerned about Mozilla should consider one of the options listed below, but these all have notable disadvantages when compared to Firefox. Mozilla has the resources to develop new features and functionality for its browser continually, and (most importantly) to regularly patch security flaws as they are discovered. Personally, I think hardened Firefox is the best privacy browser solution available. Firefox is available for Windows, macOS, Linux and Android. There is a Firefox for iOS app, but this is crippled by Apple’s restrictions on rival browser rendering engines. It also lacks many features available on other platforms - most notably support for Firefox add-ons. Tor Browser is primarily designed to provide secure access to the Tor anonymity network. I discuss the pros and cons of Tor in my full Tor Review, but Tor itself is not the focus here. Tor Browser is based on Firefox but has been hardened out-of-the-box to improve security and privacy. Note that it is easy enough to harden regular Firefox in the same way manually. Using Tor Browser, however, is widely regarded as the best way to defeat to browser fingerprinting techniques. As long as you use the default settings, do not add your own browser add-ons, and use the browser at its default window size (not in full-screen mode) then one Tor Browser looks identical to another Tor Browser. On the other hand, this means that won’t be able to run all the other funky privacy-enhancing Firefox add-ons out there. So swings and roundabouts. Good news, however, is that if you want the protection from fingerprinting that Tor Browser affords, but do not want the slowness of Tor itself for your day-to-day browsing, you can run Tor Browser without Tor. Although Tor Browser is based on older versions of Firefox (52.5.2 at time of writing), the Tor team are very good at staying up-to-date with patches for the latest security issues. At present, however, you will not benefit from the speed advantages of the new Firefox Quantum (57+) browser. The Tor Browser is available for Windows, macOS, and Linux. A special hardened version of Tor Browser is also available for Linux, which features additional security measures. Waterfox is an open-source browser based on Firefox. In many ways, it is fairly plain vanilla Firefox 56, and there are no plans to move beyond this until at least 2019. This means that it supports both legacy Firefox add-ons, and the new add-ons. It includes tracking protection and will sync with your regular Firefox account. Some stability issues have been reported with Waterfox, but these only affect a tiny minority of users. The biggest problem is that it is stuck on Firefox 56 (for the time being at least). This means no Quantum speed boost, but may have more important security implications. Waterfox is essentially a one-man project, and he seems to be doing a good job at ensuring Waterfox incorporates the latest Firefox security patches. The problem is that these patches are for a different version of Firefox (currently 57). This could result in Firefox 56 (and earlier)-specific vulnerabilities being left unpatched. Can Chromium code be trusted not to call home? 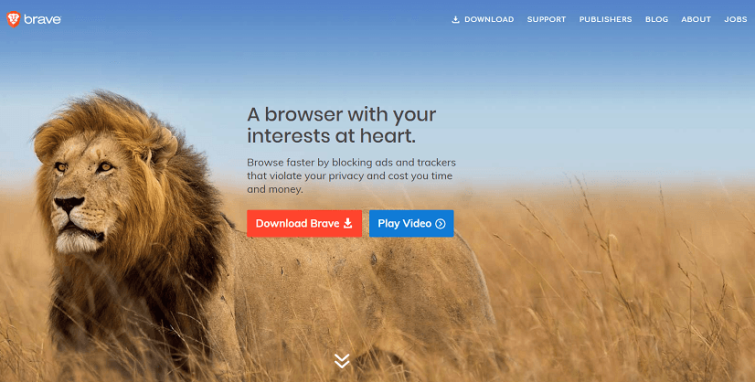 Unlike all the other browsers in this roundup, Brave is based on Chromium instead of Firefox. Chromium is the open-source code behind Chrome, with all the closed proprietary bits stripped out (at least in theory). It comes with a built-in ad-blocker, tracking protection, script blocker, and HTTPS-Everywhere functionality. Brave also features one-click anti-fingerprinting and WebRTC leak protection. And anyone pining for Chrome will feel at home instantly. Brave helps to fund itself via an ad-replacement program. This replaces “bad ads” with “good ads” from its network partners, with the option of users taking a cut from the ad revenue. Participating in this program is opt-in, but detractors feel it adds to a problem that privacy browsers are supposed to be fixing and therefore compromises the company’s integrity. Although open source and nominally “de-Googled,” there is every reason to mistrust any code produced by Google. It is almost impossible to guarantee the code is 100% clean and is no calling home. 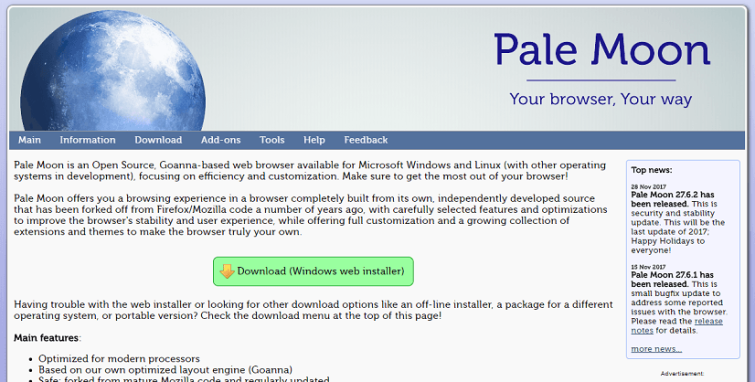 Pale Moon is a lightweight and highly customizable open source fork of Firefox. Unlike Waterfox, its code has diverged substantially from Firefox. It is compatible with many classic Firefox add-ons, but not all of them. It is not compatible with Firefox’s new WebExtensions add-ons. It also has a growing library of add-ons that have been rebuilt specifically for Pale Moon. 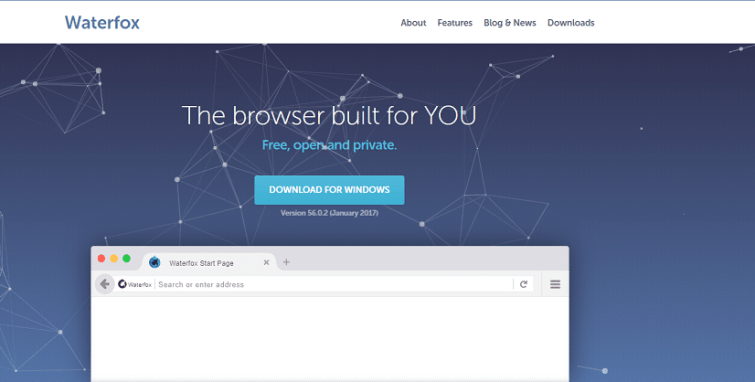 Much of Pale Moon has been updated with code from more recent versions of Firefox, but its user interface remains the highly customizable XUL-based frontend last seen in Firefox 28. This includes support for a wide range of custom themes and skins. Pale Moon does not offer any special privacy “features” as such, but it contains none of the dubious privacy-invading features found in modern Firefox. Although it provides “close adherence to official web standards and specifications,” Pale Moon is still working on full support for HTML5 and CSS3, so it can struggle rendering some web pages. It sometimes said that it lags a little behind when it comes to security updates, but this is very unfair. It can take up to a week before Mozilla allows the Pale Moon developers access to its latest patches, but these are always implemented as soon as possible and are always up-to-date. Pale Moon is available for Windows and Linux. The following browsers have not made our top five list, but may be worth your consideration. Firefox Focus is billed as a privacy-focused browser for Android and iOS. Key features include tracking protection and ad-blocking (using the Disconnect block list). All browsing is effectively performed in Private Mode, so no browsing records are stored locally. It is also a very stripped-down browser, and so does not have all the unwanted “features” found in full Firefox. On the day-to-day usability front, however, its lack of full support for tabbed browsing makes Firefox Focus difficult to recommend. Tabbed browsing is now supported, but only by right-clicking on an existing link -> Open link in new tab. The fact that you are permanently it Private Mode also means that passwords and logins are not saved between sessions. Another major issue is that about:config is not accessible in Firefox Focus. This means you cannot disable WebRTC, which makes VPN users susceptible to WebRTC leaks. GNU IceCat is just Firefox with the trademarked branding removed to comply with the GNU Project’s free software guidelines. IceCat is available for GNU/Linux, Windows, Android and macOS. IceWeasel is very similar to IceCat, except for Debian and without IceCat’s additional privacy features. Now that Firefox has returned to Debian, IceWeasel is no longer maintained. Both IceCat and IceWeasel are based on older (pre-Quantum) versions of Firefox. SeaMonkey is in many ways in the same “family” as Pale Moon, in that it uses Firefox code and the Gecko rendering engine. It is different from all the other browsers listed here, however. It is the spiritual successor for the all-in-one Netscape 4 Communicator suite, and incorporates a browser, an email and newsgroup client and a WISYGIG HTML editor. Some might argue this makes it very bloated, but most modern hardware can the bloat easily. SeaMonkey is great for those who want an old-school internet experience, but in terms of updates and security patches it lags behind Firefox. As mentioned at the start of this article, company-owned browsers such as Chrome, Edge, and Safari all pose privacy concerns. Google is a company that fully cooperated with the NSA in its PRISM mass surveillance program. You can check out Google’s own detailed breakdown of how Chrome affects your privacy here. The long and the short of it, however, is that Chrome is basically just spyware for Google. 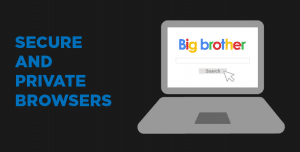 Although it does offer user-controlled privacy settings, these are very hidden away, and users have manually to opt-out of features that invade their privacy. Even with all user-controlled privacy settings locked down, there is every reason not to trust Google to just not spy on you anyway. Microsoft is in a similar position to Google, so it’s Edge and Internet Explorer browsers cannot be trusted. Crucially, all these popular browsers are closed source. This means that there is no way to verify that they contain no malicious code or are otherwise not doing something they shouldn’t. All the browsers in this list are open source and provide much more privacy than Chrome, Edge/Internet Explorer or Safari. Despite very real issues, I personally find hardened Firefox to be the most useful daily driver as the most secure browser. It is a fast, fully featured, and very secure browser that has a lot more respect for your privacy anything else in its class. That said, there are real issues with Firefox, so it is lucky that there are some good alternative options. I have my own questions about Mozilla the corporation vs Mozilla the organization. I do feel that its a increasing problem for Mozilla as they have become bigger and in turn have reintroduced Google Search as their default search engine, and are again very much funded by Google. Personally I feel Mozilla has certainly become more interested in its survival then its users which has shown up in a dwindling market share. Its not a bad organization by any stretch, but clearly Mozilla is more about Mozilla these days then about its users. I notice that your articles have a strong security focus - which I like. However in the case of browsers I think that the new browser called Search Encrypt is a worth contender to the top spot. Are you aware of it? And what would your considered opinion be. I'd be pleased to read that as my computer assessment skills are nor as good as your skill & knowledge. Thanks. A few years ago I read about some entities self-described as "non-profits", but which paid the execs very large "salaries". The suggestion was that they were scams. I'm not suggesting Mozilla is engaged in anything like that, just that you asked the question. Hi Pooter, I don't think Mozilla is in any way a "scam": after all, it does develop an excellent and entirely free open-source browser! I'm just unsure what "non-profit" means in this context.